In particle physics a cascade of secondary particles can be produced as the result of a high-energy particles interacting with dense matter. The incoming particle interacts with atoms in the material in a number of ways producing new particles with lesser energy; each of these will continue on creating many thousands, millions, or even billions of new interaction until all the energy has been absorbed. Fig. 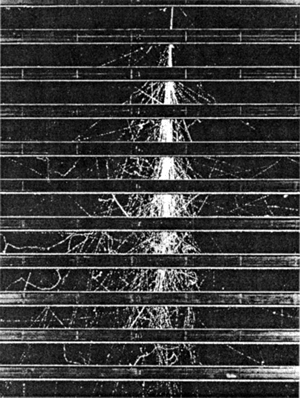 1 to the left is a cloud chamber photograph (MIT cosmic ray group) of a particle traversing a series of brass plates demonstrates that a single particle can indeed give rise to multiple secondary particles. Cosmic rays are known to have energies well over 1020 eV, far higher than the 1012 to 1013 eV that any Terrestrial particle accelerators can produce. These showers create their own cascades of high energy particles in the earths atmosphere from collisions, smashing atom nuclei apart to create positive and negative pions and kaons that subsequently decay into muons which still have energies at sea-level greater than 4 GeV. 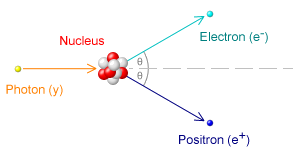 At these high energies particles interact with matter converting into electron-positron pairs from pair production or interact with the atomic nuclei or electrons to conserve momentum called the Bremsstrahlung effect. High-energy electrons and positrons primarily emit photons, a processes called Bremsstrahlung and Electron–positron annihilation. These two processes continue in turn, until the remaining particles have lower energy. Electrons and photons then lose energy via scattering until they are absorbed by atoms. In the case of a high energy muon created by a cosmic rays event, there are a number of different processes by which muons lose energy and create these electromagnetic cascades as they propagate through matter. The continuous energy loss of muons passing through matter at relatively low energy transfers to atomic electrons to ionise the atoms along the muon path. In the electric field of a nucleus or atomic electrons, muons can radiate high energy photons, which may also kickstart other interactions such pair-production. A muon can radiate a virtual photon which, again in the electric field of a nucleus, can convert into a real e+ e- pair. 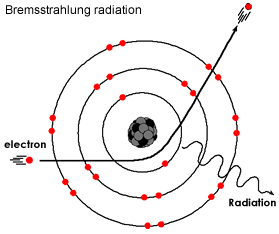 A muon can radiate a virtual photon which directly interacts with a nucleus in the atom. The interaction is either electromagnetic or following the fluctuation of the photon into a quark-antiquark pair (i.e. 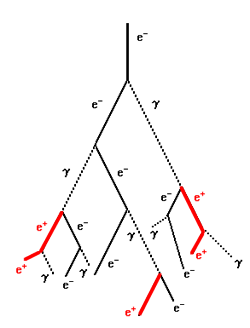 a virtual vector meson). Muon interactions with electrons can produce free electrons with large enough energies to travel a significant distance and produce Cherenkov Radiation. These are termed knock-on electrons. This effect was first reported in a 1964 publication on the historical understanding of the nature of the cosmic radiation, the scientist Bruno Rossi describes an experiment where cosmic rays could penetrate dense materials. Finding that cosmic radiation at sea level could penetrate over 1m of lead. In these same experiments he was also surprised to record a higher rate of detection, as many as 35 per hour as the thickness of lead increased peaking at 1.5cm and then falling slowly. When the upper part of the lead shielding was removed the rate fell to about 2 detections per hour. This effect has now been confirmed to be a direct result a electromagnetic cascades as a result of a high energy muon passing through.